Turn yesterday’s turkey into today’s star-studded feast with this quick and easy recipe for The Best Leftover Turkey Salad loaded with fresh veggies and herbs. If you’re reading this post, chances are you’re staring down a mountain of leftover turkey (or perhaps even chicken!). And whether it’s the result of your Thanksgiving feast, or just the remnants from an ordinary dinner, the bottom line here is you’ve got leftover turkey and you need to put that poultry to work. Have I ever got you covered! Grab your knife and get ready for The Best Leftover Turkey Salad to ever cross your lips. When I was a culinary intern at Food Network, it was my job to prepare the staff meal each day, and one of my favorite ways to make the most of all of the insanely delicious leftover odds and ends from Food Network Kitchens was to make any variety of chicken or turkey salad. So let’s just say that over the course of several months, I got my turkey salad recipe nailed down. The Mayo to Mustard Ratio: I’m a mayo enthusiast, but when it comes to chicken or turkey salad, I like to go light. Too much mayo can yield a very thick and heavy salad, while just the right balance of mayo and Dijon mustard produces a medley of flavors that don’t overpower the refreshing crispness of the veggies and herbs. My Not-So-Secret Ingredient: Are you ready for this one? We all know I’m a big fan of secret ingredients in my chocolate chip cookies, smoothies and mashed potatoes, and this time, I’m upping the flavor profile with … sugar! 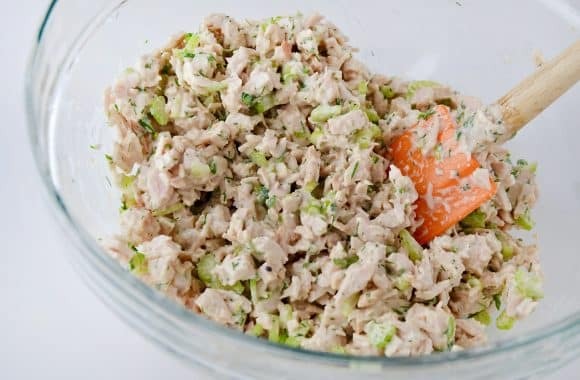 It sounds strange in a savory turkey salad, but one taste and I guarantee you’ll never go without it. 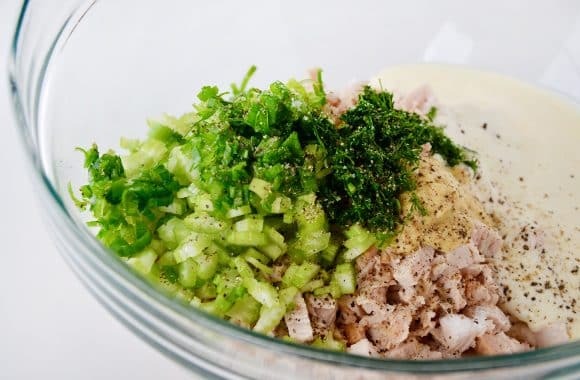 In a large bowl, combine the chopped turkey, mayonnaise, mustard, lemon juice, sugar, celery, scallions and dill, stirring until well combined. 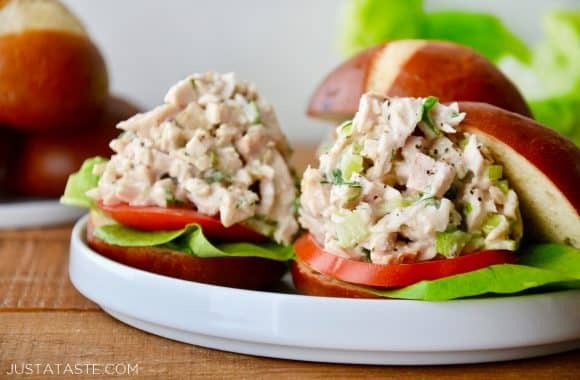 Taste and season the turkey salad with salt and pepper. Serve immediately or refrigerate, covered, until ready to serve. I prefer less mayo in my turkey salad, but you can easily add more based on your taste preferences. 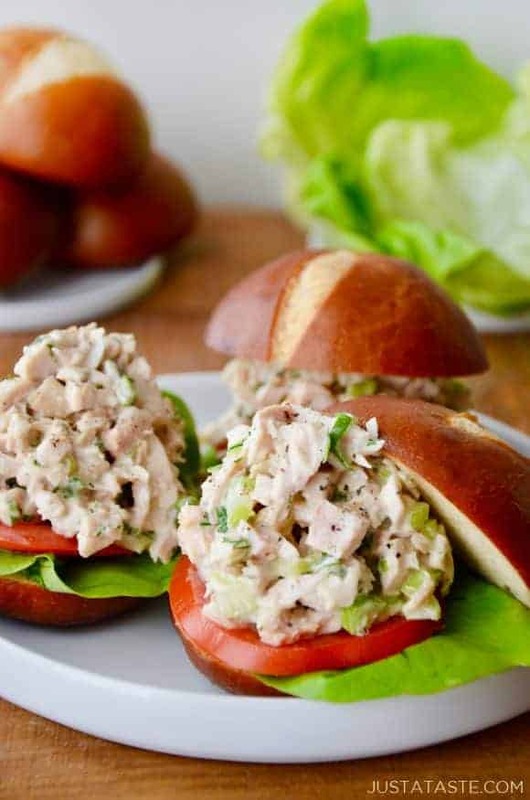 For an extra-creamy turkey salad, increase the mayo to 2/3 cup. I always think turkey salad tastes best after refrigerating, so this leftovers-inspired recipe tastes just as great on day 2 and onward!